Widely praised as a major contribution to Pauline studies, Richard Hays's Faith of Jesus Christ is now available in an expanded second edition complete with a new preface by the author and a substantial dialogue about the book with James D. G. Dunn. In this important study Hays argues against the mainstream that any attempt to account for the nature and method of Paul's theological language must first reckon with the centrality of narrative elements in his thought. 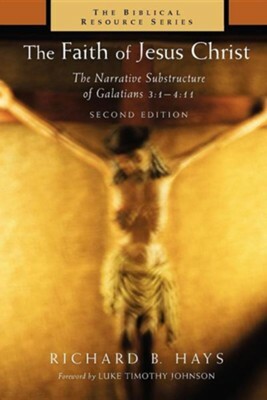 Through an in-depth investigation of Galatians 3:1-4:11, Hays shows that the framework of Paul's thought is neither a system of doctrines nor his personal religious experience--both of which are both of which are the most common approaches to Paul's writing--but the "sacred story" of Jesus Christ. Above all, Paul's thought is guided by his concern to draw out the implications of the gospel story, particularly how the "faith of Jesus Christ" reflects the mission of the church. In this important study Hays argues against the mainstream that any attempt to account for the nature and method of Paul's theological language must first reckon with the centrality of narrative elements in his thought. Through an in-depth investigation of Galatians 3:1-4:11, Hays shows that the framework of Paul's thought is neither a system of doctrines nor his personal religious experience but the "sacred story" of Jesus Christ. I'm the author/artist and I want to review The Faith of Jesus Christ: An Investigation of the Narrative Substructure of Galatians 3:1-4:11.